We have a new load of (qty 95) 6X6, Haworth Premise Enhanced Cubicles ready to go. These are in very good condition and come with one upgraded box box filing cabinet, one two drawer lateral file, cockpit work surfaces with grommets, upgraded fabrics and paint. 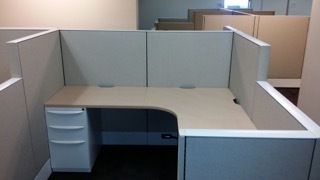 These cubicles are 54″ tall and 48′ tall on the drop down and come with power down the spine. We can create multiple configurations with this inventory so please chat or call today. We offer free space planning and design with every project. We would be happy to lay in any of our cubicles into your provided drawing.